Wash the kale well. Those curly leaves can be full of sand. Tear kale pieces off the main fibrous center stem. 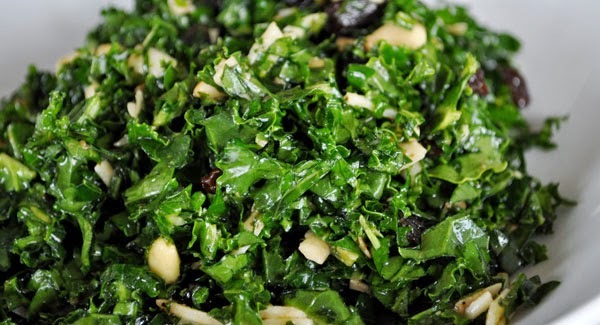 Add the kale to a large mixing bowl, season with salt, pepper and drizzle with olive oil. Massage with your hands making sure to coat the kale with oil. This will begin to break down the tough kale cell structure. Grate the zest and squeeze the juice of the lemons over the massaged kale. Add the balsamic vinegar. Add the currants, toasted pine nuts, parmesan and toss to combine. Serve with a pinch of red chili flakes, if desired.